In looking through the recipes on my blog, I couldn’t believe I had yet to post a waffle recipe. 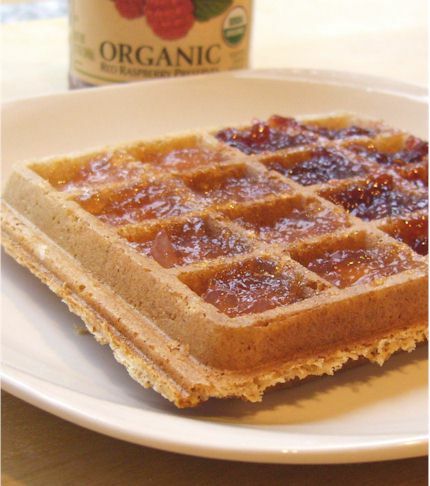 Though I go through phases, I somewhat frequently whip up batches of the insanely easy Oatmeal Blender Waffles from Go Dairy Free to have on hand. They freeze beautifully, and make a hearty breakfast that I can have ready in just five minutes (a quick pop in the toaster) when I don’t feel like making a big effort for breakfast. Also, I do love oats, but I find a bowl of oatmeal weighs really heavy on my stomach as the first meal of the day … and though I can see how many bloggers love putting nut butter in their oats, the resulting texture is not pleasing to my palate. But, when I did some experimenting with my trusted blender waffle recipe, injecting it with some naturally healthy nut butter, I ended up with amazingly quick and easy waffles that don’t weigh you down. Yet, they are rich in fiber, and have just enough healthy fats and protein to keep me satiated. Usually, I avoid sugar in the morning, but that hint of dark brown sugar makes these wonderfully noshable on their own. Of course, my sugar-addicted husband still tops them with maple syrup! Okay, are you ready? Throw all ingredients in your blender, and let ‘er rip for about a minute. The batter may be hearty looking, but that is all good. Now, preheat your waffle iron and coat it with cooking spray (baked goods with nuts tend to like to stick). This will give your batter about 10 minutes to thicken. The thicker the batter, the more bready the waffles. I like the batter really thick, but if it gets too thick to pour at any point, blend in some more milk alternative or water a tablespoon at a time. Make waffles according to the instructions with your waffle iron. Eat waffles. Tip #1: If you have a cheapy waffle iron like myself, you may not want to follow the little “all done” light. I usually let them cook until I can visibly see little to no steam emerging. You know I’ve never thought to make my own waffles in advance and freeze them. Sheesh you sure are smart! I’ve never actually made waffles….. lack of waffle iron! I made these back when I got the book! I loved them, as did my husband. I used water at the time, but I think milk would make them better. I haven’t made them since…what in the world and I waiting for??? OH lord those look amazing. 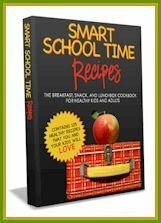 i am such a sucker for waffles and pancakes, and I can’t believe how few ingredients go into these waffles!!!! I’d love to try these except I was wondering if it’s possible to substitute the nut butters for anything else?? Would it work with say, apple sauce? Just this weekend, for the 1st time in my adult life I swear, i created my version of vegan GF pancakes! using coconut flour & oats and well…you can read all about it, if you’re interested 1 post ago. It’s been ages since I’ve had waffles and I love them. 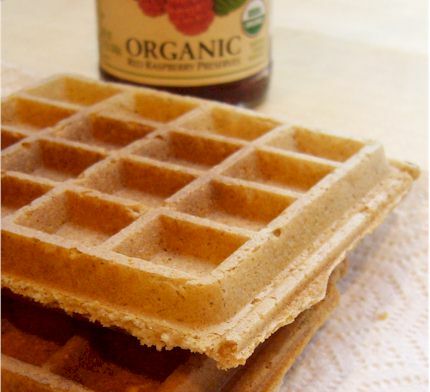 This recipe reminded me of the oat-corn blender waffles I used to make. They were great! love it! I’m a big fan of the ‘blend healthy foods into waffle/pancake” since i work with so many kids who are selective and cannot handle advanced or mixed textures. Also prefer ‘bread-y’ foods! May I repost on my blog? I like waffles! They are my favorite breakfast and I like it with honey! I’m with ya. I rarely do oats in the morning because they sit too heavily with me. I prefer savory oats at night 🙂 Love these waffles though- great recipe and they came out looking PERFECT! Michelle, definitely feel free to substitute the nut butter with another ingredient that has a somewhat similar texture. I love bananas in these. Hello my foodie friend!! You had a great question, which I will totally address in another post because I’m sure others are thinking it!! The idea with barefoot running is that you naturally shift your running stride right under your body because you have to or it hurst like…it hurts. So by default you start to have better running form. Thanks for the question, I will make sure to dig up more info! Things that I learned today – I really don’t make enough homemade waffles. These look so delicious! I love that they have oats in them. What a clever recipe! That is amazing! Only if I had a waffle iron. I cannot wait to make these and they will be beyond gobbled up in my house by all not just those of us on a GFCF diet. These were really good and made the house smell wonderful. Thanks for the recipe. I gave it a try and they were tasty, but a bit too dense. I might add more yeast in the next batch. Excellent recipe – family fav! These were awesome! My picky husband and daughter both ate them up without complaint (once they tried them… lol). This is nothing short of miraculous! Thanks for an awesome recipe! So glad you and your family enjoyed my recipe Sharma! I made these this past weekend as I had a friend over who is gluten-free, dairy-free, and allergic to eggs. I tried them and they are delicious! 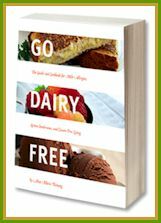 Making me look at making more Gluten-free and Dairy-free recipes! Thank you! I love your recipe. We make it about 1x per week. Thank you! What did I do wrong? I followed the directions and the waffles wouldn’t come out whole. The crumbled like crazy and I had to scrape them out with the back of a wooden spoon. Any ideas? Hi Sue, a lot of things can affect the outcome of waffles. Make sure your waffle iron is greased as it should be and that you have the temperature right. Some work better when on a higher setting. Also, the batter could be thicker or drier if you aren’t using a nut butter that has enough of its oils. If it was a bit pasty rather than soft or even a little fluid, then your waffles might not have had enough fat and moisture. Make sure you have a somewhat thick batter, but one that is still pourable. Consistencies can vary by altitude, humidity, etc. so it helps to get used to the correct batter consistency and adjust the liquid accordingly.